A darling autumn client wedding was recently featured on Style Me Pretty and my shameful lack of free bloggin’ time has kept me from properly posting. Here are some of the beautiful photos from the Cafe Brauer wedding, captured by Amanda Hein. Dramatic sweeping views from the room where the girls dressed. Final touches before the dizzying events of the day got underway. Escorted by her father, the bride made her way to her awaiting car that would take her to meet her future husband. 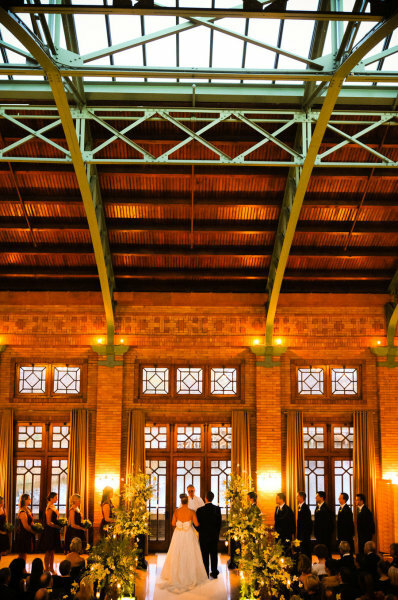 Both the ceremony and reception took place in the historic ballroom of Cafe Brauer. The officiant that performed the ceremony also married the brides’ parents decades ago. 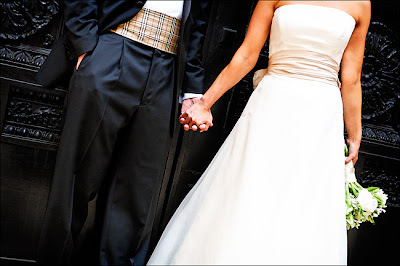 The ceremony was heartfelt and perfectly tailored to the head-over-heels couple. 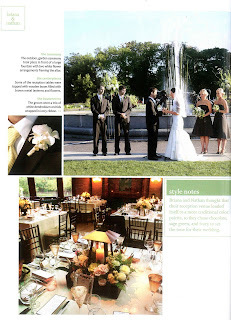 The I Do’s with Lincoln Park Zoo as the backdrop. 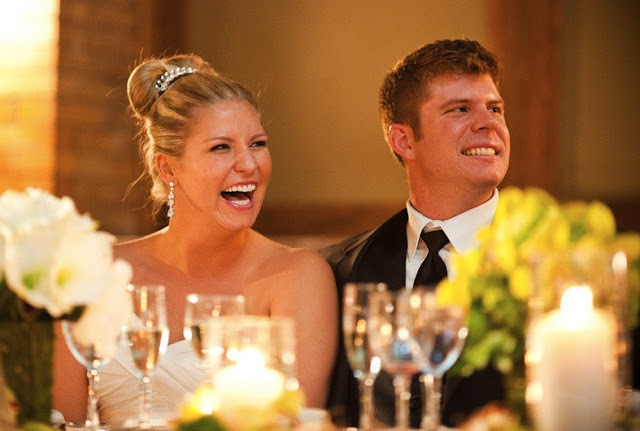 After the ceremony, the celebration continued with loads of laughs and a packed dance floor from start to finish. I love love loved working with J&G and their lovely families. It was evident that this special day was merely the start of a lifelong love affair. Continued best wishes, you crazy lovebirds! A favorite client of mine, Alison, came to me (along with with my favorite planner friend Lisa Gia Bascomb of Parties Etc.) 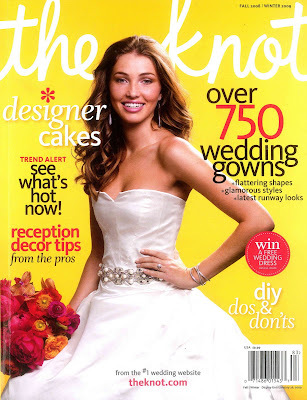 to help her design their November wedding last year. 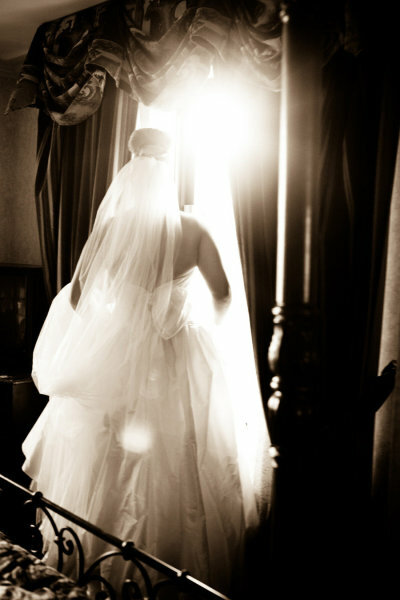 She wanted their day to have a classic, warm feeling – but did not want it to look expected nor stereotypical. 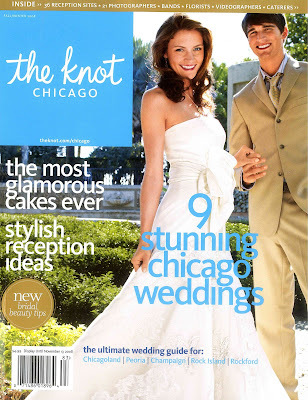 Their beautiful wedding is now featured in the current national issue of The Knot. 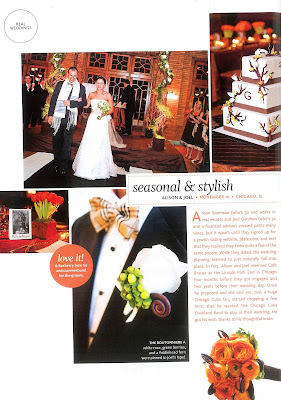 Both the ceremony and the reception were held at one of our favorite venues (perfectly suited for a fall wedding), Cafe Brauer. 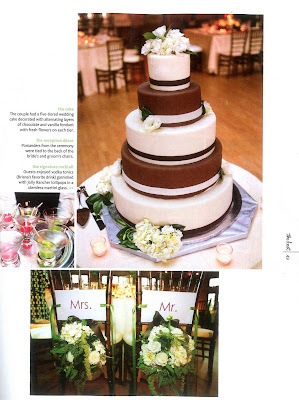 The ceremony took place under a worn, wrought-iron chuppah, a canopy created from billowing rich chocolate taffeta chosen to compliment the table linens. The front of the chuppah was designed with a rustic collection of natural grapevines, white fluffy hydrangea, open garden roses and seasonal foliages. Her color palette of chocolate brown and rich burnt orange was the perfect compliment to the raw brick setting. With a guest count that allowed us to play with the size and shapes of the tables, we decided to seat guests at a collection of square tables and long rectangular tables. The square tables hosted vintage rusted urns designed with textural collections of green Dutch hydrangea, orange ranunculus, tulips, roses, looped magnolia foliage (to showcase the velvety brown backing) and rope-like hanging amaranthus tumbling from the arrangement. The rectangular tables hosted mono-floral collections of the saturated orange blooms to create a cleaner, more streamlined look running down the length of the table. The Cub’s Dixieland Band surprised guests with serenade during the cocktail hour. Here are a few more beautiful photos, shot by the amazing Pen Carlson duo. Cafe Brauer has a wonderful skylight detailed with raw, exposed beams that are perfect for hanging things from. Here, to add to the warm, rustic feel, I suspended dozens of mason jar votive candles – twinkling above guests as they danced. 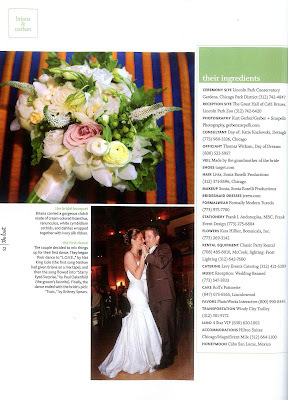 Alison’s bouquet was designed with out-of-season blooms including lilac, parrot tulips, lisianthus and ranunculus to name a few. 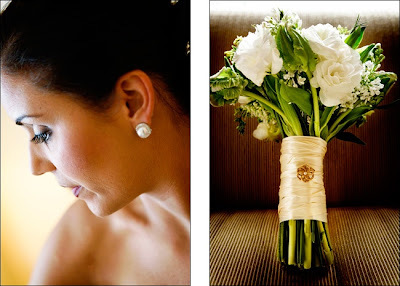 I wrapped her bouquet with textural swiss silk ribbons, secured by her grandmothers vintage brooch. 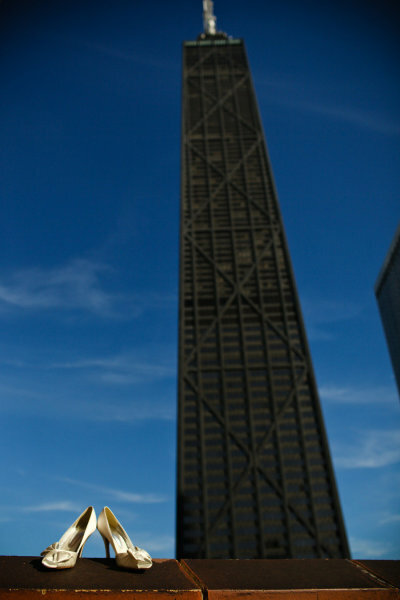 Below is one of my favorite shots…so artful. 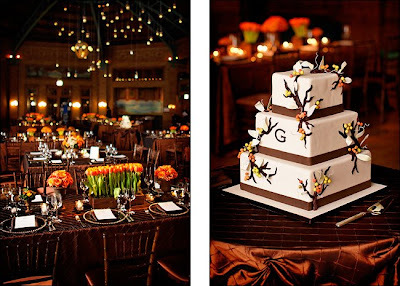 Her chilly November wedding left guests in awe of her Martha-worthy personlized details and perfectly special day. Briana and Nate got married in the gardens outside the Lincoln Park Zoo, on one of the most beautiful days of the early fall. 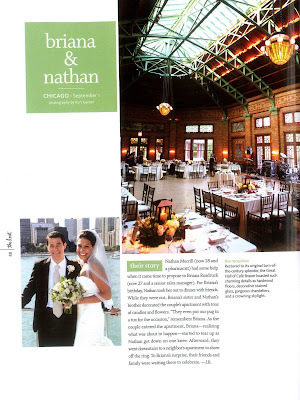 Her charming wedding reception took place at the legendary Cafe Brauer, one of our favorite venues. The site has a warm, rustic, prairie-style feel to the space. Briana wanted to play up it’s key attributes, and therefore selected a color palette of creams, sages and chocolates. I used a selection of varied containers – from richly stained wooden pieces (that complimented the rented chairs) to vintage rusted urns. We found lanterns that reflected the arts-and-crafts architecture of the venue and worked them into some of the designs. During the ceremony, we had rustic shepards hooks hosting gorgeous, lush pomanders noting her aisle. The intention was to relocate all of the pomanders to the chairs of the bridal party table – but because she was blessed with such a gorgeous, sunny day – the pomanders were looking quite tired by the end of the ceremony. We created a pair of show-worthy ones to highlight the bride and grooms chairs from extra event flowers. Nothing like improvising! Briana’s bridal bouquet was gorgeous and the perfect accessory to her chic, sophisticated dress. It was designed in classic whites, creams and champagne hues – but executed with flowers like lisianthus, veronica, dahlias, cymbidium orchid blossoms, ranunculus and hypericum berries to give the bouquet an elegant rounded silhouette, rich in texture. Working with the oh-so-savvy wedding consultant, Katie Kozlowski of Dettagli, was a blast and we were able to execute a wedding for our friend Briana that lived up to her very high standards! 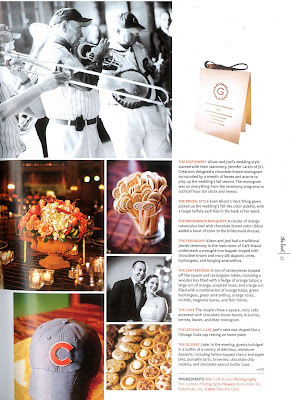 Additional notes: Thanks to the wonderful Kurt Gerber of Gerber and Scarpelli (who shot my wedding!) for the lovely images!